Chico Buarque, Ana Carolina, Yamandu Costa, Guinga, Marcus Tardelli, Marco Pereira, Ulisses Rocha, Hamilton de Holanda, Ângela Muner, Daniel Santiago, Rogério Caetano, Mauricio Carrilho, Luciana Rabello, João Lyra, Oscar Ferreira, Alessandro Penezzi, Juarez Moreira, Fernando César, Jayme Vignoli, Flávio Apro, Giacomo Bartoloni, Swami Jr., Rosa Passos, Zé Paulo Becker e todo o Quarteto Maogani têm mais em comum do que o fato de serem músicos: todos eles possuem um violão de Lineu Bravo, luthier de Sorocaba que vive desde 2008 em Taubaté. 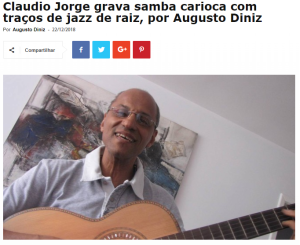 Cláudio Jorge, musician from Rio de Janeiro and Lineu Bravo’s client, is featured in the media and collects a 35-year-long career. The musician from Rio de Janeiro, Cláudio Jorge, is a guitarist, composer, singer, arranger and producer and collects a 35-year-long career. He was featured in a Brazilian Newspaper named “GGN” to talk about his new album. He has been in the project, with 15 tracks, for a long time and it was inspired in his childhood musical memories: a lot of samba and ‘bossa nova’ with jazz influences. 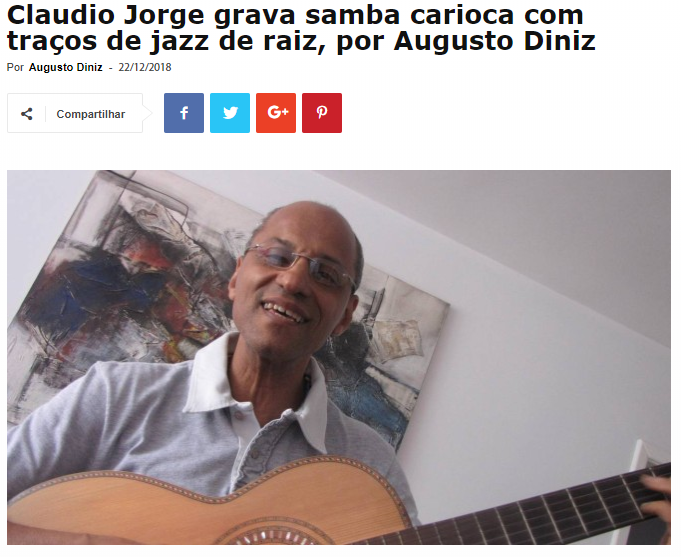 The album is called “Samba jazz, de raiz” and it took 3 years to be recorded. The new project contains 15 tracks: “The melody of the songs is similar to the samba from Rio de Janeiro, but I gave it a ‘jazz treatment’. It is an album in which the songs are more important than the arrangements”. The luthier Lineu Bravo made him an instrument in 2013: a 6-string guitar with Canadian cedar top, Indian Jacaranda Back and ebony elevated fingerboard. Brazilian musician who was born in Rio de Janeiro, Cláudio Jorge collects a 35- year-long career, which started when he was 20. His compositions have been already recorded by many important Brazilian singers, such as: Emílio Santiago, Elymar Santos, Ângela Maria, Joana, Élson do Forrogode, Alaíde Costa, Zeca Pagodinho, Elza Soares, Roberto Ribeiro, Zezé Mota, Jorge Aragão, Martinho da Vila, Joel Nascimento, Sivuca, Luiz Carlos da Vila, and Arranco de Varsóvia. He has also partnered up with important names, such as Cartola, João Nogueira, Aldir Blanc, Nei Lopes, Hermínio Bello de Carvalho, Ivan Wrigg, Ivor Lancellotti, Délcio Carvalho and Martinho da Vila. Some of his composition partners include Nei Lopes, Luiz Carlos da Vila, Ivan Wrigg, Délcio Carvalho, Cartola, Ivor Lancellotte, Ivan Lins, Elton Medeiros, Martinho da Vila, Mauro Diniz, João Nogueira, Wilson das Neves, Sidney Miller, Arlindo Cruz and Manuel Rui. 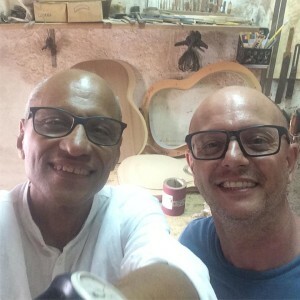 Lineu Bravo is an autodidact luthier and fond of good music. From an early age he developed intimacy with wood at his father workshop. He built his first instrument when he was 14. Since then, his guitars, ‘cavacos’, mandolins and ‘violas’ have been purchased by respected musicians. Guinga, Marcus Tardelli, Zélia Duncan, Marco Pereira, João Bosco, Yamandú Costa, Chico Buarque, Ulisses Rocha, Hamilton de Holanda, Ângela Muner, Rogério Caetano, Maurício Carrilho, Luciana Rabello, João Lyra, Maurício Marques, Edson Lopes, Alessandro Penezzi, Juarez Moreira, Fernando César, Jayme Vignoli, Flávio Apro, Giacomo Bartoloni, Swami Jr, Rosa Passos, Ana Carolina, Zé Paulo Becker, and Douglas Lora are some of them. The luthier Lineu Bravo was recently surprised by watching on television the show “Em Trânsito” by the musician Lenine. During the performance, Lenine sings along with his band and plays a lot of guitars. At one point, he plays, without his band, a Lineu Bravo guitar. The luthier immediately recognized the instrument and was staggered by that. Lenine is a Brazilian artist who sings his own compositions and makes verses that explain our time. For him, word and music have always walked hand in hand. 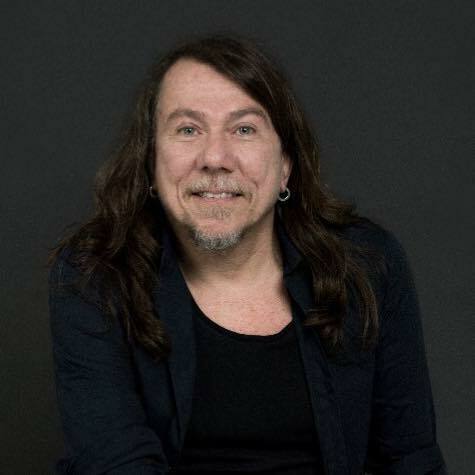 He was born in Recife, on February 2nd, 1959, and his first music references are: Ângela Maria, Cyro Monteiro, Bach, Chopin, Jackson do Pandeiro, Miltinho, Ary Lobo and Dorival Caymmi. Lenine went to Rio de Janeiro in the late 70s, searching for a career progression. With composer friends, he followed his way composing and creating, trying to survive producing Brazilian Popular Music when everyone was playing Rock music: “It was not easy, but it certainly was essential for what I do today”. He performed in partnership with a lot of talented musicians over his career, such as: Fernanda Abreu, O Rappa, Milton Nascimento, Maria Rita, Maria Bethânia and Elba Ramalho. Lenine, who loves producing his own albums, has also produced for some friends such as Maria Rita, Chico César and Pedro Luis e a Parede. About his albums: “I think “Olho de Peixe” is the most important album of my career. Because it helped me to find out that the music can take me wherever I want”. 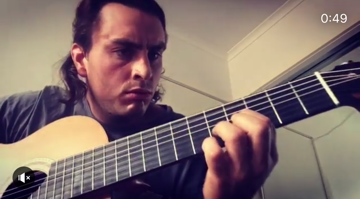 The musician Maximillian Rudd, Lineu Bravo’s Australian client, studies Brazilian music and he is graduated at Melbourne Conservatorium of Music. Max liked his 7-string guitar that was made for him so much that he decided to order the second one, just like the other: with Indian Jacaranda Cedar. Now, he has one for tours and another one for recordings! Brazilian seven-string guitar virtuoso and vocalist Maximillian Rudd delivers a dynamic show of original music based on his eclectic array of Brazilian, blues and roots influences. Maximillian Rudd is a young Aussie guitarist at the forefront of an international Brazilian guitar explosion. Alongside his Brazilian seven-string guitar, Maximillian is hard at the coalface, experimenting with the unlikely fusion of Latin American, jazz, blues and roots influences. An accomplished guitarist with formal training in classical and jazz at the prestigious Melbourne Conservatorium of Music, Maximillian has extensively pursued the music of Brazil both in Australia and in South America. Maximillian’s sound is uniquely his own, arising from his eclectic musical journey, beginning the guitar at the age of seven and intensely developing his craft ever since. Maximillian’s edge resides in his undisputed instrumental ability, which has become the trademark of his live set. Maximillian has played at some of Victoria’s premier music festivals, such as Port Fairy Folk Festival, Queenscliff Music Festival and St Kilda Festival. 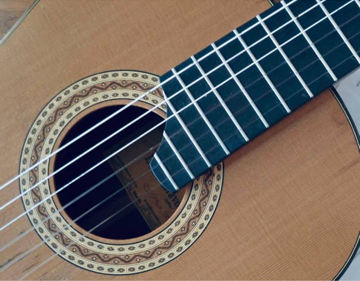 Playing a Brazilian seven-string guitar, Maximillian is undeniably a student of the ‘violão brasileiro,’ the great tradition of Brazilian guitar, taking his place as a burgeoning outsider amongst a lineage of Brazilian guitarists and musical innovators, from Baden Powell, to Raphael Rabello and beyond. As an instrumentalist and occasional vocalist, Maximillian’s performance engages with seasoned ears, hinting at the ‘this and that’ of modern guitar culture, sewing it all together with the subtle creativity of an eclectic musical upbringing. The album draws together the ever-colliding worlds of the Americas, from New Orleans southward bound, rendering it a series of portraits within which listeners can glimpse the nuances of music’s global mobility in the modern era of mass media, from the personal perspective of a young Australian artist. Maximillian Rudd ordered this first 7-string Lineu Bravo guitar with Indian Jacaranda in 2011. He liked it so much that, in 2018, he decided to order the second one with the same setting. Now, the musician has one for tours and another one for recordings! Guitarist, composer and arranger Marco Pereira makes a successful career in Brazil and abroad. The guitarist, composer and arranger Marco Pereira has recently posted a beautiful picture of a 6-string Lineu Bravo guitar on his Facebook page. The talented Lineu Bravo’s client, who is from São Paulo, is a guitarist, composer and arranger. He has been consolidating an admirable career over the years, in Brazil and abroad. Lear more about it! Marco Pereira is a guitarist, composer and arranger. 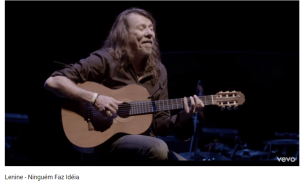 He is from São Paulo, where he had guitar lessons with Isaias Sávio at “Conservatório Dramático e Musical de São Paulo”. He lived in France for five years and has a Master’s degree in Classic Guitar (Université Musicale Internationale de Paris). He also wrote a book named “Heitor Villa-Lobos, sua obra para violão” and has achieved the first place in many important music contests. In Brazil, he created two guitar courses at University of Brasilia. He has also recorded two albums that leaded him to the Town Hall, in NYC. He has already played in partnership with important Brazilian musicians such as Luciana Souza, Zélia Duncan, Edu Lobo, Cássia Eller, Gilberto Gil, Gal Costa, Wagner Tiso, Daniela Mercury, Zizi Possi, Rildo Hora, Paulinho da Viola, Tom Jobim, Milton Nascimento, Leila Pinheiro, Fátima Guedes, Nelson Gonçalves and Roberto Carlos. He received the Sharp Award in 1993 and in 1994. Marco plays as a soloist in the USA and in Europe. He also works as a teacher at ‘Universidade Federal do Rio de Janeiro (UFRJ)’. Marco released didactic material for musicians, such as a 7-string method in partnership with Rogério Caetano, also a Lineu Bravo’s client.